You'll be able to play Just Cause 3 with your friends next week, thanks to the launch of the multiplayer mod. 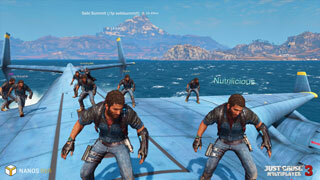 Way back in January, we reported that the Just Cause 3 multiplayer mod had gone into beta testing. Now, roughly six months later, the mod is about to be released. Designed by a group of fans from Germany, Austria, and the UK that call themselves Nanos GBR, the mod will let you play "countless hours of hilarious brawls, stunts and races with hundreds of other players," according to its listing on Steam. The mod also lists "community created gamemodes" as one of its features, so you can expect that there will be some interesting additions as the mod becomes more widespread. The Just Cause 3 multiplayer mod is launching on July 20. You can download it on Steam once it launches.